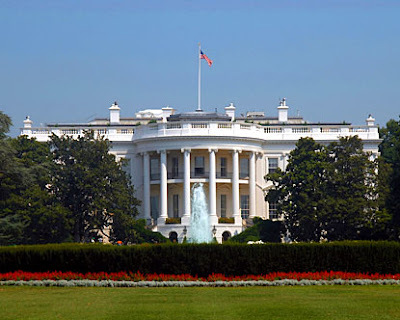 Pictures: Piesporter Goldtroepfchen, Mosel and White House, Washington DC. Phil Bernstein from Addy Bassin's MacArthur Beverages, one the great Wine Stores in Washington DC, presented his new portfolio to the Capital Chapter of the German Wine Society of America. So, you had a combination of two, American consumers who are really into German Wine and one of the best retailers in the American market. What did we taste? The following review sheds some light on the American Taste for German wine. All wines were from very well established winemakers, from the cream of the crop. All the winemakers have at least 3 Grapes Gault Millau, many had 4 and some 5 Grapes. There are about 60.000 winemakers with more than 0.5 hectares and 6.000 winemakers with more than 5 hectares of land, of which about 250 have 3 or more Grapes Gault Millau. So, we were in the 0.5% top echelon. There were no red wines on the list, although there is a red wine boom in Germany. The share of red wines in terms of production has increased from 10 percent in the 1980s to about 35 percent now in Germany. Of course, given its location, the German red wines tend to be not like the fruity red wines we know from warmer countries, but lean and more elegant, with a lot of finesse. 30 years ago, in the international scene, people would not talk about German red wine. But this has changed. Germany now produces red wines that can compete with the best of the world. The red wine boom has not yet reached the US and it is very difficult to find these wines in the US. I tasted the other day with one of my fellow Board members Washington State wines which reminded me of the lean, elegant German red wines. He prefers, he says, the lush juice red wines from warmer regions. So I would dare to say that American lovers of white German wine will not be fans of German red wine. Almost all wines were sweet wines. The structure of the portfolio of MacArthur or any other American retail wine store is very different of the structure of the portfolio of wine store in Germany. In Germany, dry wines dominate. In the US, sweet wines dominate. There were no noble sweet wines. What you can find a lot in the US are the German flagship wines, the noble sweet Beerenauslese, Trockenbeerenauslese and Eiswein, made from botrytized or frozen grapes. There is nothing you can do to prevent these wines from becoming noble-sweet. As a result of the noble rot or the freezing of the grapes, the grapes have such high sugar content at harvest, that it is impossible to make dry wines from them. They are very popular in the US and American demand is high. They account for a large share of award winning wines in the US, but do not at all play that prominent role in Germany. They are well known and appreciated, but they are not the wines, people are talking about. Of course, they are expensive and this explains why they were not included in the tasting, although they would have been much appreciated. All the sweet wines were at the Kabinett and Spaetlese level. At the Kabinett and Spaetlese level (as well as at the Auslese level), the sugar content of the grapes at harvest are such that if left to mother nature only, these wines would be bone dry. To produce sweet wines at these levels of sugar at the point of harvest requires an additional effort by the winemaker. There are principally two ways for making wine sweet that do not have enough sugar. First, you do not let the fermentation run its course and stop it. As a result, you get delicious sweet and low level alcohol wines. Second, you let the wine fully ferment to a normal alcohol level and then add “Suessreserve” which is sterilized juice to achieve the desired level of sweetness. There were no Grosse Gewaechs Wines. These are at a minimum Spaetlese and mostly Auslese wines, bone dry, expensive, of course, and they don’t have many followers among the German Wine Society membership. Driven by the objective to restore the prestige of Germany’s significant vineyards and to help the consumer in terms of distinguishing dry from sweet wines, the wineries that are members of the Verband der Praedikatsweingueter (VDP) introduced the concepts of Erste Lage and Grosses Gewaechs a few years ago. In a first step, all vineyards were rated and the best parcels of them were identified as Erste Lage (First Site). Second, the Grosse Gewaechs concept was introduced. A Grossese Gewaechse wine is always fully fermented and dry. Andin terms of the sugar content of the grape at harvest, it has to be at the Auslese level, although the label always just indicates QbA. This gives the winemaker the possibility to chaptalize in order to increase the alcohol content in the wine, if desirable. The Grosse Gewaechs label is thought to resemble the Grand/Premier Cru designation in neighboring France. Here and there, these wines are dry. Grosses Gewaechs refers to a top dry wine from a top vineyard. Finally, the Rheingau does not use this concept, but the concept of Erstes Gewaechs, which basically means the same. All the wine were Rieslings. Of course, Riesling is the king of German wine. But there are other grapes, which are popular in Germany, like Silvaner or Grauburgunder. These other white grape varieties are largely absent from the American market. American lovers of German wine go mainly for Riesling, sweet Riesling. The large majority of wine was from the Mosel. 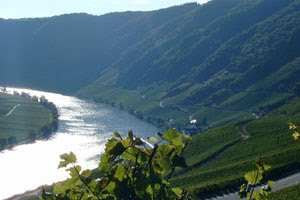 Mosel is well known for producing light and sweet Kabinett and Spaetlese wines that are made sweet and low in alcohol by stopping the fermentation. They are very special and very popular in the American market. They have their followers in the German market. This event provided an opportunity to taste the new German vintage, 2008. In the words of Terry Theise, "What's often most impressive in 2008 is the eerie perfection shown by several of the lightest wines. It's as if they're saying: We may not have gotten a lot of sugar but we got a ton of everything else." Here are the wines. Hm, this makes one wonder how the inventory of German wines in this store stands out when compared to other wine stores in the area... I guess it really doesn't! I wish I could find my beloved Frankenwein more readily available here in the US! no problem, let me know what you want ! Interesting! Nice summary. Wine shops in the U.S. are a nice thing... Miss them! Me, personally, I think that Germany should REALLY focus on its Riesling. I understand, it is more exciting for the vintners to work with additional and new grape varieties and to show how good they are even with other sorts. But, if this is our competitive edge, then lets work on it and go really 'wild' with Riesling creations, instead of trying to build a too wide a grape-portfolio and thus risking to get little 'insignificant', in relation to the world market. Well, it is good to know that you, Christian, are involved over there, I am sure, this will be of great assistance for our wonderful German wines! thanks for your thoughts and your best wishes. I was just elected to the Board of the Washington DC Chapter of the German Wine Society. I am personally leaning towards dry German wines, but I am leaning against the wind here in the US and I accept that. A very belated thank you for the post, as I just read your article now. As a German wine lover in the States, I wanted to offer you a fewe thoughts. First, I am well aware that the of the influence that importers have over here. Certainly, Terry Theise and Rudi Wiest are our most significant importers of German wines. Therefore, Americans have tended to favor wines from their portfolios over the past couple of decades. Valckenberg is a distant third to Theise and Wiest. As far as Trocken Rieslings many Americans who admire high quality German wines have been focused on fruity and sweet Rieslings for a long time. For example, older Parker guides focus almost entirely on fruity and nobly sweet wines from Germany. Until a few years ago, there seem to have been very few high quality dry German Rieslings available in the US; Koehler-Ruprecht and Muller-Catoir being notable exceptions. I myself am a more recent convert to German wine, and have therefore had the advantage of having far more Trocken Rieslings to choose from than I would have just a decade ago. Also, I suspect that most of the great German dry Rieslings never make it out of their home country, leaving foreigners like us with much smaller quantities to choose from. That frequently means that only the most dedicated German wine aficionados in the US end up buying these wines. To his credit, Terry Theise has also made a great point of promoting the merits of Scheurebe and Rieslaner - especially the former. It certainly helped that Terry is the longtime importer of Muller-Catoir to the US, and Hans-Gunther Schwarz did more than anyone else to demonstrate the potential for Scheurebe to produce great wines. This is why you will see many more American notes on German Scheurebe than on German Weissburgunder, for example - even though Weissburgunder has a considerably nobler status in Germany. I am concerned that Scheurebe and Rieslaner are not receiving enough respect in Germany these days - many of us can attest that they are capable of making great, highly individual wines. I wonder how many Germans in the wine trade would bother to include a Scheurebe or a Rieslaner in a tasting these days? Spatburgunder is still a niche product in the US, both due to the price and availability. As good as the best German Spatburgunders are, it is hard for most merchants to sell them when you can buy a great 1er cru Burgundy for approximately the same price over here. Thank you for you interesting article. I would also add that Scheurebe is more popular in the United States than the white Pinot varieties. Terry Theise has done an excellent job over the years to promote the virtues of "Scheu", which seems to be ignored by Gault-Millau and many german wine drinkers just because it is a fairly recent crossing. Dry Rieslings are gradually becoming more popular in the States, as they have been more willingly embraced by Gen X/Y German wine lovers. I do hope that Germans themselves will soon rediscover the pleasure and inherent greatness of fruity Rieslings as well.